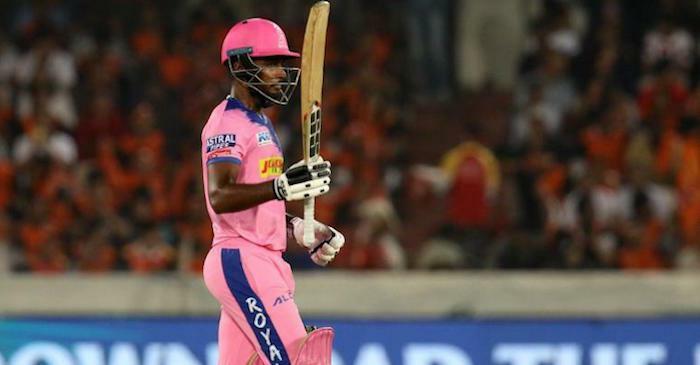 Sanju Samson registered the first century of IPL-12 but ended up on the losing side as Sunrisers Hyderabad beat Rajasthan Royals by five wickets, in Hyderabad, on Friday. Samson's hundred was overshadowed by David Warner's blistering fifty. The dashing Australian set up the platform for Sunrisers with a breezy 69 off 37 balls. He and Jonny Bairstow (45 off 28) put up a century stand for the opening wicket to dash whatever hopes the visitors may have entertained after posting a huge 199 runs. Sunrisers needed a quick start to fancy their chances of eclipsing Rajasthan's imposing total of 198 for 2 and Warner and Bairstow provided the impetus for the rest of the batsmen to follow as the hosts chased down the target in 19 overs. It was Sunrisers's highest successful run-chase. It would have been a double blow for Sunrisers had Kulkarni not dropped Bairstow at third-man a ball later. However, Kulkarni made up for the lapse on the final ball of the next over, latching on to a fine catch at the long-off to send Bairstow packing. Skipper Kane Williamson (14) and Vijay Shankar (35 off 15) played aggressively to bring the equation within reach but three quick wickets, that too off consecutive deliveries from Shreyas Gopal (3/27) in the 16th over, changed the complexion of the game. The stage was set for a tense finish, but Yusuf Pathan (16 not out) and Rashid Khan (15 not out), later named man of the match, played sensibly to overhaul the target. Earlier, Samson came out firing on all cylinders and battered the Sunrisers bowlers during his unbeaten 102 that came off just 55 balls, with the help of 10 fours and four hits over the fence. It was his second IPL hundred. His first century in the T20 tournament was in 2017.